Do I need Water Line Insurance? What is it anyway? Do I need Water Line Insurance Coverage? Recently, we have had many customers calling to find out if they need to buy the additional water line coverage offered by their water companies or another third party. Most of our customers believe there is coverage on their homeowners insurance for their service lines, so why should they purchase this coverage elsewhere and waste their money. The simple answer is, any lines, including water and sewer, from you house to the street are typically not covered under your home insurance policy. What is considered a service line failure? 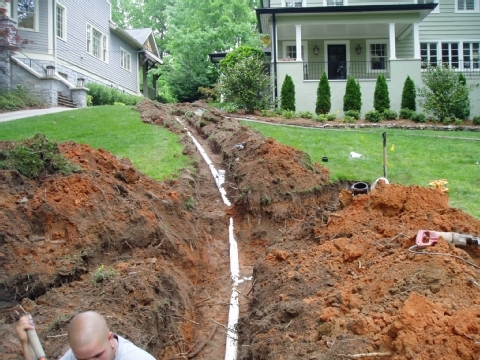 While any typical third party water line coverage on offers coverage on your water lines and could cost over $200 per year and typically won’t cover the excavation costs which could amount to tens of thousands of dollars. A large rock abuts an underground sewer line directly under the insured’s sidewalk prior to entering the home. Years of wear mar the pipe and cause leakage requiring excavation and replacement of the pipe. Salt water from a saline pool deteriorated the connection to the main water line. The connection had to be replaced. A tow truck lost control and ended up in the front yard of the insured. The weight of the vehicle broke piping to the sprinkler system. A large tree fell in the insured’s yard. The root structure was pulled from the ground damaging the buried line and connection to the propane tank from the house. An old sewer pipe running under a driveway deteriorates and starts leaking. Repair of the pipe means the driveway needs to be dug up. The total cost of replacing the remaining pipe is $15,000. The cost to replace the damaged segment of sewer piping is $3,500. The cost to excavate and to repair the driveway is $4,000. Contact your agent to find out if your homeowners insurance company offers service line coverage and if not, feel free to contact us to get a quote with a company that does.